We often see media articles that claim new research has found health effects from human exposure of some chemical or physical agent. In the case of electromagnetic fields (EMF), we have seen such studies claiming effects of exposure to EMF. But what is rarely discussed is whether the claimed ‘effect’ is a biological effect or indeed a health effect. What’s the difference you ask? Biological effects are a response to stimulus or to a change in the environment around you and are not necessarily bad for your health. Health effects are changes in health resulting from exposure to an agent or source. Eating a freezing cold ice cream can give you a ‘brain-freeze’ (ice-cream headache), a sensation which goes away a short time after you stop eating it. Going for a run or sitting in a sauna will cause your body temperature to rise. These biological effects are not considered health effects because the result is temporary and not detrimental to your health. in the scientific community that the effect occurs for the specified exposure condition." versus the biological effect as “alterations of the structure, metabolism, or functions of a whole organism, its organs, tissues, and cells. Biological effects can occur without harming health and can be beneficial. Biological effects also can include adaptive responses." From these different explanations, we can clearly see that there is an important difference between a biological effect and a health effect, even though many articles do not differentiate between the two – whether it is in relation to EMF or in other contexts. So when you are reading the next article, it might be interesting to see whether the authors make the proper distinction between the two, and if they don’t, it may say something important about the quality of the reporting. Institute of Electrical and Electronic Engineers Inc (IEEE) IEEE Standard for Safety Levels with Respect to Human Exposure to Radio Frequency Electromagnetic Fields,3 kHz to 300 GHz. IEEE; Piscataway, NJ, USA: 2006. We have all seen media articles that claim that a new study has “proven” a chemical or physical agent causes some health effect, usually cancer. While such results might look scary or at least surprising to the reader, scientists usually react differently and point to the “weight of scientific evidence”. What does this term mean and how does it apply to scientific studies related to electromagnetic fields (EMF) research? The ‘weight of scientific evidence’ approach means that no single study can answer any scientific question, and must not be viewed in isolation but against the backdrop of previous research. Factors such as the quality of the data, consistency of results, nature and severity of effects and relevance of the information are all important considerations for experts to determine appropriate weighting to be given to the evidence. This approach is important to consider in research on radiofrequency (RF) electromagnetic field (EMF) health effects when individual studies provide different or conflicting results. Individual studies need to be seen in the light of the total research effort into mobile phone health and safety. Scientific investigation is subject to potential errors, personal opinions and uncertainties. This applies as much to research on RF EMF health effects as it does to all other areas of science. Weight of evidence assessment is a process in which evidence is integrated to determine the relative support for possible answers to a scientific question. The term ‘weight of evidence’ on its own is the extent to which evidence supports possible answers to a scientific question. This is what is assessed by weight of evidence assessment, and can be expressed qualitatively or quantitatively. A process of weighted integration of lines of evidence to determine the relative support for hypotheses or answers to a question. World Health Organization: What are electromagnetic fields? People around the world have adopted mobile phones like few other products in human history. When mobile phones were first introduced to the market in 1983 no one could have predicted the profound and far-reaching impacts that mobile and wireless communications would have on the world. Yet with the technology constantly evolving at such a rapid pace, it is important to acknowledge that not everyone has been entirely happy about these developments. For example, public concern has existed about whether the radio signals from mobile phones and other wireless devices have any impact on our health. For those living near base stations, there are many who have welcomed the greater connectivity and speed that such developments allow, although there are some who have also been concerned about the constant exposure to yet another radiofrequency source in their environment. The telecommunications industry takes these concerns seriously and while the benefits of the technology are clear, industry must ensure that any concerns are addressed through open and transparent information, as well as independent quality scientific research that paves the way for health authorities and governments around the world to provide the best available advice to the public. The Mobile & Wireless Forum’s role in this area is to support such research and help contribute to the development of standards for the industry to use to ensure compliance of the various products and services, thus allowing people to enjoy the full benefits of the technology. As part of the 20th anniversary of the association, we have summarized our research efforts in a new booklet. In the booklet, you will find an overview of the international research agenda, the main bodies involved in reviewing the scientific evidence, key issues and terms explained and discussed as well as details on the MWF’s research programs. You’ll also get an understanding of the work currently underway on new compliance methodologies for future 5G devices and the development of new technical standards. The booklet concludes with a summary of where we are in terms of knowledge and understanding after 20 years of research, and the lessons learned ranging from societal impact to the public understanding of scientific research. You can download “20 Years of Research” from the MWF website. The advantages of e-labelling in terms of cost savings, reduced environmental impact, improved traceability and transparency seem undeniable and three out of four companies active in the EU and questioned on whether they would opt for e-labelling if it was allowed, confirmed that they would welcome it. It is for all the above reasons that we believe that e-labels represent a smart approach for the smart age. 5G is the fifth generation of mobile networks which will be a significant evolution from today’s 4G LTE networks. 5G is being designed to meet the very large growth in data and connectivity of today’s modern society, the internet of things with billions of connected devices and tomorrow’s innovations. Like prior generations of telecommunications, 5G uses radio waves or radio frequency (RF) energy to transmit and receive voice and data connecting our communities. 5G will use different frequencies designed to allow greater capacity compared to current mobile technologies. 5G will first work in combination with existing 4G networks. Base stations will be upgraded and many smaller antennas will supplement the existing network and provide more capacity. The transition for consumers will be seamless. Future devices will be 5G capable and will then connect to 5G networks whenever available, using 4G networks in between. More capacity and faster reaction times – what for? 5G technology provides additional capacity, faster connections and a very fast response time of as little as 1 millisecond. To put that into context, 4G already provides response times of 30 milliseconds while the human mind perceives everything under 100 milliseconds as instantaneous (1). These technological advances open the door for ever more refined services: real time information in traffic, remote monitoring of patients, super accurate location services for emergency services and navigation, autonomously driving vehicles, smart homes and cities. When will we be able to use 5G? 5G networks are currently being trialed in many pilot projects around the world, with commercial launches expected in 2020 and widespread availability of 5G expected around 2025. If you are interested in more information about 5G or how it will work have a look at the brochure “5G and EMF Explained”. The EMF Explained Series provides information on mobile technology and Electromagnetic Fields (EMF) referencing international health authorities, government, academia and the telecommunications industry. The EMF Explained Series has been developed by the Australian Mobile Telecommunications Association (AMTA) in association with the GSMA and Mobile and Wireless Forum (MWF). The first 5G Workshop organised by the Mobile & Wireless Forum (MWF) back in 2016 posed a number of questions related to exposures and compliance assessments above 6GHz. One of the aims of the BioEM 2018 Pre-Conference Workshop: EMF Exposure from 5G equipment – the state of art research and standardization therefore was to follow-up those questions in light of the research work that has been carried out over the intervening period. The program for the 2018 Workshop was structured to begin with an overview of EMF exposure standards, discuss skin physiology, thermal responses of the skin and ocular studies moving onto discussions related to averaging times, and absorption mechanisms and finally specific challenges related to compliance standards and compliance assessments of devices and networks. The MWF sponsored this Workshop to promote an understanding of the research and standards for 5G and as such the presentations from, and the views expressed by, authors do not necessarily represent the views of the MWF. Some of the research projects presented here were sponsored by the MWF and GSMA and again, the views are those of the authors and do not necessarily represent the views of either the MWF or the GSMA. Wireless communication devices such as mobile phones and tablets, like many other electronic products need to comply with a large range of European regulations before they can be put on the market and require a number of markings to show compliance. The traditional requirements for compliance reporting and physical labels affixed to the device cost an enormous amount of money: EU companies in the computing, multimedia & telephony sectors pay €3.9 billion for compliance every year, with compliance information consuming up to 20% of that sum. These are the findings of a study by economic and policy consultancy firm Valdani Vicari & Associati (VVA) who carried out a cost-benefits analysis of introducing an e-labelling scheme in Europe. 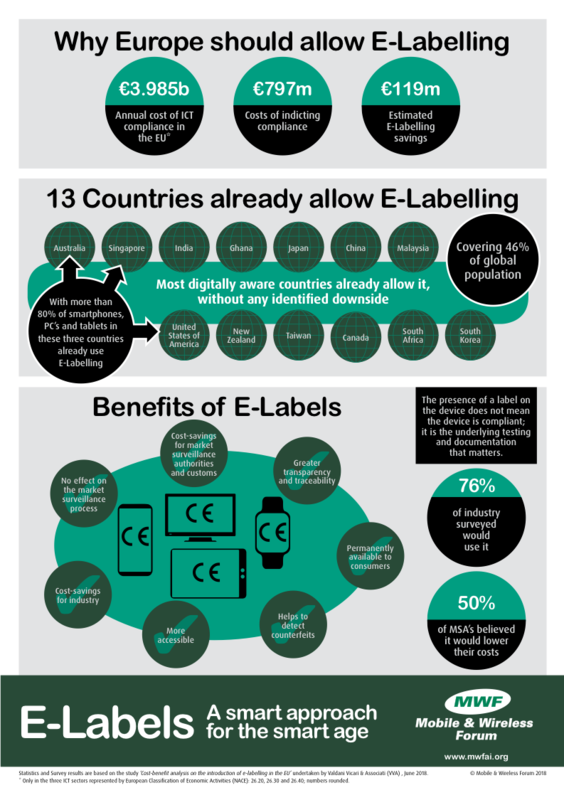 e-Labels are an alternative form of providing compliance information, either electronically through embedding it in the software of devices with a built-in screen (or that can be connected to a screen) or through machine readable-codes, such as QR codes, for other products. e-labels offer greater security, accessibility and longevity of the compliance information (remaining in the device as opposed to a paper report that is stored far away from the device in use) while also streamlining and simplifying the delivery of the required information. VVA’s study showed that the introduction of e-labelling would reduce the overall cost of indicating compliance by 15% for companies active in the EU, that three out of four companies questioned would opt for e-labelling if it was allowed and that they see a possible positive impact on innovation as well as a reduced environmental footprint of products. 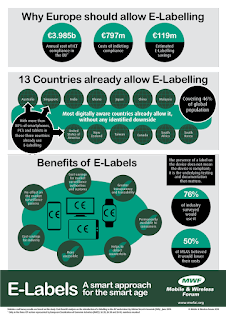 To date, at least 13 countries in the world, representing 56% of the global economy and 50% of the world population, already allow the indication of regulatory compliance through an electronic label. In a second study, VVA analysed the introduction of e-labelling in three highly digital aware markets: Australia, Singapore and the US. it already covers most electronic products in these countries without any adverse impact on market surveillance authorities, customs agencies or consumers. e-labelling improves traceability and transparency, as compliance information is more easily available and remains within the product. So, an easy step towards reducing operational costs, environmental impact, administrative hurdles and furthering innovation? Overall yes, but changing established procedures is never that easy. In this case, it will need the agreement of 28 market surveillance authorities to revise their routine of controlling the compliance of electronic devices and upgrade their internal proceedings to match technological developments, which in and of itself might be a worthwhile exercise. Both studies were presented in June at an event hosted by MEP Anneleen van Bossuyt in the European Parliament. The National Toxicology Program (NTP) has published the draft results of a 2- year study investigating the effects of high exposure to radiofrequency energy in rodents. The results will be subject to a three-day scientific review meeting in March 2018, after which the final reports on the studies will be completed and released. 1998. Market penetration for mobile phones in the UK was 25%. 2G was the standard and in Finland, the first downloadable content - a ring tone - was sold to mobile phones. In that year, the major players in the sector also decided that they would need an industry body to coordinate their RF research efforts and that could present a common voice for the mobiles sector: the Mobile Manufacturers Forum (MMF) was born. 20 years and a slight name change later, the Mobile & Wireless Forum (MWF) is active in almost 60 countries around the world and has become a respected stakeholder for governments, regulatory authorities, standardisation organisations, civil society organisations and other industry bodies. promoted the advancement of scientific knowledge and the open discussion of issues through sponsorship of workshops, conferences, collaborative research projects and visits. promoted awareness of the threats posed by counterfeit devices and accessories and engaged with governments on the implementation of national responses. 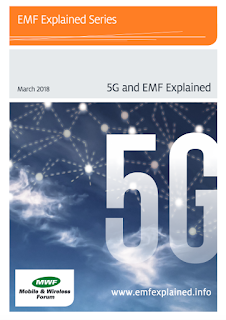 To celebrate the 20th anniversary, the MWF is preparing a new publication that will provide a concise and informative overview of its various research efforts relevant to wireless communication, including our work of new compliance methodologies for future 5G devices. We will also have workshops on a number of topics, including 5G, tackling counterfeits and accessibility. Follow the @MWFupdates Twitter account and the mwfai.org website for announcements and updates.